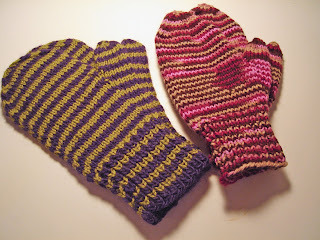 Here on the left is the next pair of mittens finished. Ann Budd's pattern book has a much better thumb than the Knit Simple pattern I made first. The mittens are a little snugger also, which I like. Anyway, they will fit the small-handed person that I have in mind for them. Now I have made two pairs. I do have to rename the new ones though. They are now called Grace after characters in The Sea by John Banville. This is an unpleasant but readable novel that won a Booker prize in the UK. Gilead by Marilynne Robinson turned out to be unreadable. It was like reading a religious Emerson or Thoreau, two authors that I cannot stand. I like philosophical novels as much as the next person, but this was too much: no plot, just pontification. 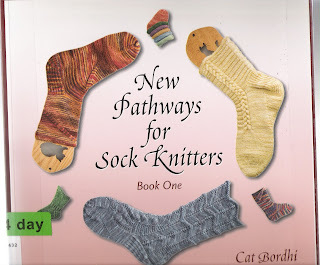 Speaking of philosophy, I have a new library book from one of the most philosophical minds in knitting today: Cat Bordhi. I must say that I have not been interested in her previous books. I was not impressed by what you can do with a mobius ring. I think the fascination is with the mobius idea rather than the thing as a knitted object. And as for knitting socks on circular needles, I have come to realize that I detest circular needles and will avoid them except when I have to knit 300 stitches back and fourth. Those cables give me the creeps. 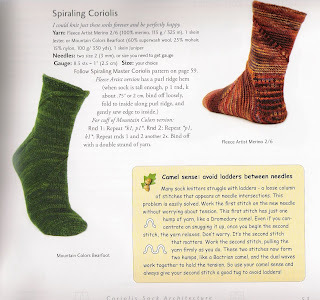 In addition to her unique and innovative designs, Cat offers tons of information about sock knitting including many charts indicating stitch numbers for all the sock parts in a lot of sizes. This enables you to design your own socks much like the Ann Budd books, but Cat's are somehow more sophisticated. This book is already in my Amazon cart, and I'm not returning the library book until it arrives. As well as being a knitting innovator, Cat Bordhi is a self-publisher, again, at a sophisticated level. Her self-designed and -illustrated sock book is pretty and fun to read. I feared from reading reviews that Gilead would be just as you describe it! Too bad, because her last book was lovely and lyrical. I feel much the same about that sock book. Such interesting ideas! You don't like Thoreau? Isn't that un-American or something? Just kidding; I think he's rather over-rated myself. The second pair of mittens is really cute. The colors are lovely, and they look as though they would fit an average hand quite well.